One thing that always intrigues newcomers to nature photography (and experienced practitioners as well) is why some people seemingly possess the magical ability to find rare plants and animals again and again. I, too, have of cause wondered how this could be. But after some years of hunting specifically for rare insects, I now begin to see that those people are not just extraordinarily lucky individuals. The main focus of this article will be on rare insects but much of the information applies equally well to any other group of animals or plants. 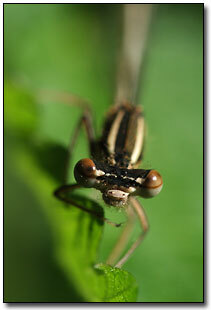 Often local inhabitants know very well what plants and animals are to be found in a specific area. Locals who may well have spent thousands of hours in a given area will be able to help you greatly in the search for well-known or highly visible species. If the hunt is for one of the more anonymous species however, the locals may not be able to help at all. Obviously contact with specialists and experts is extremely helpful when searching for rare and "difficult" species. It should come as no surprise that the experts have a very thorough knowledge about the less known species, something that locals often have not. Likewise, if the area is sparsely populated, help from an expert is often needed. I made good use of expert help this spring when I searched for the Pale Pasque Flower which is extremely rare in Denmark. Through research I had narrowed down the search area to 7.5 square kilometers. Unfortunately finding a 10 cm tall flower on 7.5 square kilometers is like looking for a needle in a haystack. By contacting an expert I got hold of a map showing the approximate location and using that map I was quickly able to find the plant. There is no need to reinvent the wheel again and again so when searching for a particular species be sure to study the observation lists closely. Particularly when it comes to the more stationary and local species searching where other people have found them before may be the best solution. By looking at the observations of Dingy Skipper, which is rare in Denmark, I was able to find and photograph the species in one single afternoon. Study And Know Localities: Every now and then you will find yourself in a situation where you have a large area to cover. In this situation it is important with thorough preparations before the actual on-site search. By studying the geology and growth in the area it is often possible to greatly reduce the area to search through. 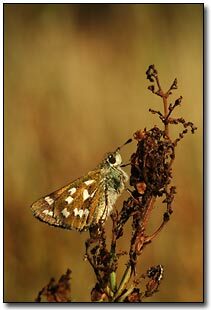 This was useful to me when I searched for the Silver-Spotted Skipper which is a rare and local butterfly in Denmark. The species requires a warm, dry environment preferably with lime-rich soil and a very specific host-plant for the caterpillars. By studying the maps and other information available I easily managed to find the species in one day. The reason plants or animals are rare is often that their preferred surroundings, also known as the biotope, is rare. Typical examples could be insects that require clean, unpolluted water in order to survive, or plants living in raised bogs. Both biotopes have become rare in many parts of the world because of pollution and draining. If you know of a special area you will often find that it is worth the effort to make a thorough search for rare species in that area. At a small lake I have visited several times during the last two years I have found 4 species of rare or scarce dragonflies and 1 scarce species of grasshopper. I have also seen several species of rare birds by that lake. It is important to have a detailed knowledge about the species you are looking for. Not just the way it looks but also preferred biotope, flight-time (or similar for non-flying species), sound, behavior and food subjects both as adult and in previous stages. A detailed knowledge is absolutely essential as a photo is often not sufficient, even a very good one. With mushrooms for example it is often necessary to note the smell, surface texture, the look of the meat, the surroundings etc. to have a fair chance of putting a name on the species. If you just return from the trip with a picture of the mushroom without having noticed those characteristics you will in many cases find that identification is impossible. Needless to say that the more rare species you have a detailed knowledge about, the more likely it is that you will encounter a rare species and be able to identify it as such. 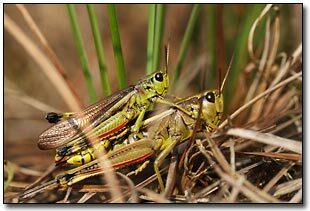 Recently I made good use of my knowledge about the sharp ticking call of the local and scarce Large Marsh Grasshopper. I had never seen the species before but during a walk I heard the sound similar to two fingernails being clicked against each other. I had a very good idea of what made the sounds and by following those I was easily able to find and photograph the insect. The knowledge about common species is just as important as that of the rare species if you want to make remarkable observations. Often it is crucial to be able to "ignore" thousands of similarly looking common specimens in order to have time to concentrate about those that could turn out to be rare. 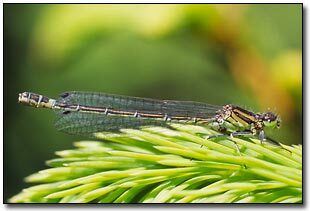 During my search for the rare Irish Damselfly early this summer at the previously mentioned small lake, I was able to find one single female and one single male Irish Damselfly. Those two insects were flying around between thousands of relatively common Northern Damselfly and very common Common Blue Damselfly. It is not everything you can learn by sitting behind a desk. At some point of time you want to actually get out there and find the animals (or plants). When searching for animals of some size in open surroundings it is always a good idea to start the search by scanning the area from a high point using binoculars. Also indications like footprints, tracks, gnawing marks, droppings and even scent can be used to judge if a particular species is present in the area. Just remember always to have your mind open to observations of other species you might encounter. Finally; the more you are out there in "the wild" the luckier you will find you become. Finding rare species is not just a matter of being extraordinarily lucky as you can see. By following the information outlined above everyone has the possibility of making remarkable observations. Click the author's gallery image on the top of the page to view the author's photographs. You can contact the photographer directly by visiting the author's gallery.